This is not your typical Gold Digger! Rather than continually drain your pocketbook, this Gold Digger helps put the coin (crypto-coins to be exact) into your wallet(s)! 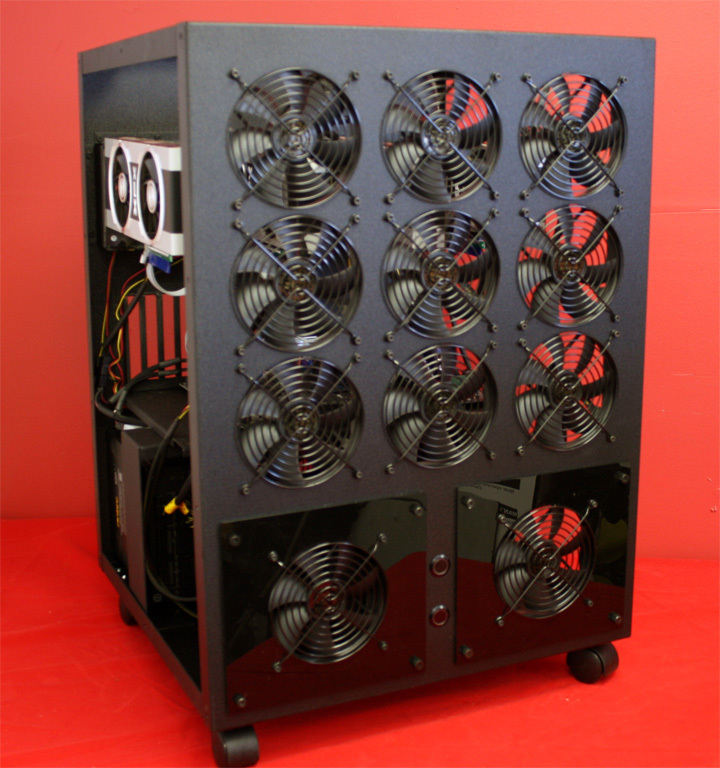 Mountain Mods Gold Digger cases are manufactured specifically for GPU mining of crypto-currencies, GPU Folding, and any need for multiple GPU’s operating at near 100% Load nearly 100% of the time. Mountain Mods Gold Digger series cases utilize the base US patented U2-UFO and Ascension designs and incorporate a whopping 20 PCI I/O bracket. The 20 PCI I/O bracket attaches to the Gold Digger case back panel. The bracket utilizes Mountain Mods patent pending “Air Assist” feature. The I/O “Air Assist” is achieved by insetting I/O Mounting holes away from the case with enough space to mount 3x120mm fans behind the bracket and internal the case back panel. The use of 120mm fans greatly increases airflow in the GPU as well as between GPU’s. The result is a drastically cooler running GPU with overall lower GPU fan speeds. The reduction of thermal load on the GPU as well as the reduction of the GPU fan speed operation increases the longevity and performance stability of the GPU. Riser cables are used to extend the GPU’s from the Motherboard below. Operating the GPU’s several inches off the motherboard results in little to no heat transference from the GPU to the motherboard itself. This also greatly reduces thermal loads on the GPU’s as well as the motherboard and components. Mountain Mods Gold Digger cases also incorporate a separate I/O panel that attaches to the motherboard allowing for the use of other PCI – I/O devices, including full size GPU’s on the mainboard if desired. The Ascension Gold Digger comes as an Open-Air kit standard. Additional side panel options are available should you desire to enclose the entire chassis. A U2-UFO Horizon Brace is included with the Ascension Gold Digger. The function of the brace is to lift the motherboard into its horizontal resting position. 2 full size PSU’s can mount underneath the motherboard tray. The stock configuration of the Ascension Gold Digger uses the Mountain Mods 10 slot I/O panel for the motherboard section as well as a standard XL-ATX motherboard tray. (NOTE – Mountain Mods XL-ATX motherboard trays are oversized for mounting of motherboards up to 10.x inches wide). An HPTX motherboard tray is an add-on option for motherboards wider than 10.x inches in width. Both the XL-ATX and HPTX motherboard trays are fully reverse compliant with smaller form factors. The Ascension Gold Digger comes standard with a Trinity front panel. The Trinity front panel has 9 x 120mm fan ports as well as 2 – 3 x 5.25 ports. The Ascension Gold Digger comes stock with 2 coverplates for the 3 x 5.25 ports. A 120mm fan mount is incorporated into the coverplates for additional air additional airflow to the PSU area. Actual 3 x 5.25 cages can be purchased with the case as an option. Power and Reset anti-vandal LED switches are included with the Ascension Gold Digger as well as 600mm switch connection kit cables. The Gold Digger includes Standard Struts, unless Pedestal Struts are specified. The Gold Digger series cases can STACK mount with any Mountain Mods 18 x 18 cases, including multiple Gold Diggers. The Pedestal Strut allows for bolting of the bottom panel of one unit directly to the Pedestal Struts. This results in a completely structurally sound STACK that will not tip-over without a huge amount of force. Adequate space exists above the 20 PCI I/O bracket to allow for easy removal and installation of graphics cards. Simply reach in unplug the power and riser cables, remove 2 thumbscrews from the card and lift it out of the security slots while removing it from the case. Various options are available for the Mountain Mods Gold Digger chassis. The bottom line is the Mountain Mods Gold Digger chassis will help keep your multiple GPU systems drastically cooler than they would be in another chassis. Keeping your GPU’s healthy instead of SICK. A SICK GPU isn’t making you coin, while a cool one will! Keep it COOL! Dig like a DOGE!